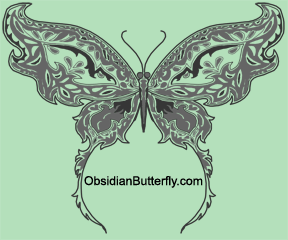 Transformations by Obsidian Butterfly is currently being transitioned to a new look so pages may not all match. Please be patient! This site contains all Gevera's non-Mayan/Aztec metaphysical knowledge. Generic Mayan-Aztec information has been relocated to its own URL at MayanAztecCalendar.com and anything pertaining to my Jaguar Nights book series has been moved to its own URL at JaguarNights.info. NEW--Please visit my arts and craft page at www.BertaBird.com! Includes links to my Zazzle and Etsy stores and samples of artwork. Changes made to site and any bits of news that don't fit anywhere else. Past updates are here. The top RSS feed is this site only; the bottom feed is all my feeds from 3 web sites, 3 blogs, Facebook, and whatever else I throw in there.